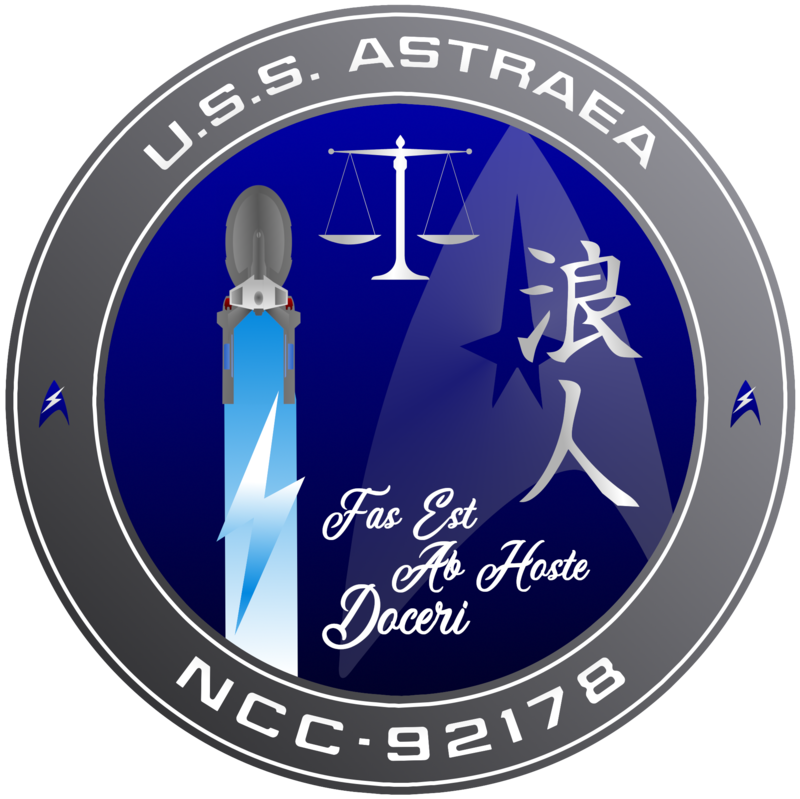 The USS Astraea NCC 92178 is a Ronin Class starship commissioned in 2378. Under the command of Captain Blake O’Reilly, Astraea was sent on a five-year exploration mission and returned home in 2383 for a scheduled a refit. In 2384, Astraea was sent out on another five-year exploration mission but returned only one year later, after an away mission gone wrong left Captain O’Reilly unable to continue his duties. A month after her return she was sent out again, this time under the command of Captain Henry Julius, on another 5-year mission of exploration. Three years later, Astraea limped home after a run in with an unknown enemy left her in need of serious repairs. Now, after a year of repair and an early refit, Astraea is ready to once again explore the stars. With Captain Julius now on to bigger and better things, Commander Arianna Warren was chosen to be her new Commanding Officer. Astraea’s home port was reassigned to the newly recommissioned Faltan Station in order to allow her to explore the newly expanded borders of the Sovereignty of Kahless. Her mission is to gather intelligence on the SoK’s movements and the recently defected House of Mo’Kai. Will you join Commander Warren as she delves into the unknown? Welcome to Astraea’s April Status Update! Time is doing that funny thing where it seems to crawl but is actually flying by! I can’t believe it’s April already! But Spring seems to be on its way, and I’m sure I’m not alone in wanting it to be here already! This month Patrick (Confusedfire) joined us. He’ll be playing Lieutenant Felan Aixae, our Chief Counselor. Lord knows we need a counselor! March brought more than just crew changes! With the help of the lovely Kris, Astraea’s site got a lovely personalized skin! I did the header, she did the skin colour changes and made it so the header worked. I also added in a mod to show the ship’s status and location. If you see anything that’s not working properly or have suggestions for further improvements, please contact me! It was a bit slow going in March for various reasons, but we still got 5 posts out! I can’t wait to see what April brings us now that we have three new players to get into the mix! I’m hoping to get mission 2 wrapped up soon and move on to mission 3, where we’ll have a lot more to do! Lt. Ren (NPC’d by me and Kris) successfully lured away two SoK Bird of Prey’s, bringing the total to search down to two. The away team led by Lt. Rhosyn successfully infiltrated one of the BoPs, but unfortunately did not come out of it unscathed. While they didn’t find the Ambassador, they still kept the ship occupied long enough for the team consisting of Lt. McCarthy and Lt. Caslma to infiltrate the second BoP. After a bit of struggle, they managed to rescue Ambassador J’apow and have brought him back to the USS Astraea. Meanwhile, on Astraea, Commander Warren had her hands full with a virus that had been released into the ship’s computer. Together with PO Liorae and Lt. Batari, and the engineering teams, Warren has been attempting to repair the damage and get that pesky virus out of the ship’s systems. The player of the month for March is Kris, who plays Lieutenant Alyse Batari. Yet again Kris has proven to be a valuable player. She had posts ready to go at the beginning of the month for when the second away team post was completed. And without her, the site would still have a generic skin. I cannot thank you enough for all your help, Kris! All characters except our new Chief Counselor are on BFMS (https://www.bravofleet.com/wp-admin/index.php). Thank you to those who have added their characters! If anyone has any ideas for character development or even some subplots, share them with us. Shout them from the rooftops if you must! Though please take into consideration time of day and your neighbour’s eardrums. That’s it for this month’s Status Update! Keep up the good work and let’s show Bravo Fleet what we’re made of! Any questions, comments, or issues, please don’t hesitate to contact the Command team. We are here for you! Welcome to Astraea’s March Status Update! These months have really flown by, but I am definitely looking forward to spring! Winter can be done now! This month saw Dave (Lt. Nathan Donovan, Chief Sec/Tac) and Andrew (Lt. JG Sayori Summers, Chief Engineering Officer) join our crew. I hope we can get them stuck in with the mission soon! There were no website changes this month. I have awarded the PoTM awards to those who have earned them. Please remember to check out the awards and nominate your fellow players for an award! February was a slow month for us with only 4 posts going out. We have been diligently working on several big JPs, but I want to stress how important it is for players to do solo posts or jps with each other. I haven’t seen very much interaction between players and I would love to see more! Come up with things that your characters can interact over! Even if it’s just running into each other in the mess and having a chat over a meal! Interact! Get to know one another! With some cunning trickery, the crew of the Astraea has lured two of the four SoK Bird of Preys away from the group. Two away teams are infiltrating the remaining ships in hopes of finding the Ambassador looking for amnesty. All the while, a civilian merchant crew member brought aboard for radiation poisoning treatment has sabotaged the ship after stealing classified intel under Commander Warren’s name. A strange anomaly and the sabotage work in concert to foil the crew’s efforts. Now they race against time to rescue the away teams, save the Ambassador, and get away from SoK territory! *Find out where J’apow is and bring him back to the Astraea. *Figure out these glitches and get the ship back in shape. The player of the month for February is Kris, who plays Lieutenant Alyse Batari. Kris is always eager and helpful behind the scenes and IC. She does a lot to help push Astraea forward and is always willing to do solo posts or pull others into joint posts to help get the mission going. She continually asks how she can help and what tasks she can complete and helps add more intrigue to the sim story line. Kris is my most valued player, often being put forth for PoTM and doing her best to support everyone on the ship. All characters are on BFMS (https://www.bravofleet.com/wp-admin/index.php). Thank you everyone for adding their characters! Welcome to Astraea’s February Status Update! Astraea is officially 6 months old! Thank you all for being here for our crazy ride! I hope things only go up from here! Also, as officially announced the other day, I am now Task Group Commanding Officer of TG Themis. Commander Arianna Warren will be promoted to Captain when our next mission has been completed and the USS Astraea will be my flagship. This won’t change anything for us IC other than Ari’s promotion again. Sadly, this month saw Steve (Lieutenant Commander Ras Th'zaanaq and Lieutenant Ren Kannu) leave. We will miss him and wish him all the best in the future. There were no website changes this month. Nothing needed to be done, but I am always open to suggestions from everyone on what you’d like to see on the site. January was a slower month, but I realized I didn’t leave a lot of room for you all to do anything. Moving forward I will endeavour to give you more time and assist with ideas on getting your characters into a plot. We did 6 posts this month, which is an excellent number considering the big jps that were going on. The message from Ambassador J’apow has been mostly translated and a plan has been put in place to lure as many of the Bird of Preys away. There is also a plan to infiltrate any remaining ships and rescue J’apow. *Lure as many Bird of Preys away from the Ambassador’s ship as possible. *Find J’apow and bring him back to the Astraea. The player of the month for January is Kris, who plays Lieutenant Alyse Batari, our Chief Science Officer and Second Officer. Kris has done a lot of work both IC and OOC for Astraea. She is always asking how she can help or what she can do to move the story on. She is an invaluable asset to Astraea! Thank you and Congratulations Kris! You more than deserve this! All characters are on BFMS (https://www.bravofleet.com/wp-admin/index.php). Thank you everyone! Welcome to Astraea’s January Status Update! Whew, what a whirlwind the end of the year was. I am still struggling to remember that it’s now 2019! The year brought about many changes for me, and brought the Astraea to life. It has been a crazy 5 months and I still can’t believe we’ve been running this long! December was a tough month, and very busy for a lot of us, I’m hoping we can pick things up and get this mission moving by the end of the month. The command team has a few fun things planned for the end of this mission, so I am eager to get us moving! This month saw a new player join us and leave us. M.A., playing Lieutenant Avathaimaru sh'Jinn, joined us as Chief Security/Tactical Officer but then went inactive. I was sadly forced to remove this player after nearly a month of no contact and just over a month of inactivity. I still intend on getting an EMH up and running. If anyone else would like to NPC a few key positions, please let the Command Team know and we will assist you in choosing and getting up to speed on what those positions need to do. December was, well, full of holiday madness for most of us. We still got 5 posts and 1 personal log out, which is excellent! In terms of storyline, it was quite slow, and I apologize for this. I’m hoping January will see us through the last of the boring bits and get on to the fun stuff! We have stumbled upon four Klingon ships in an odd, circular formation. Upon our arrival we received a damaged and garbled message from one of the ships and learned that Ambassador J’apow was looking for aid. The player of the month for December is Stuart, who plays Lieutenant Liam McCarthy, our Executive Officer. While his character may be brash and unapproachable, Stuart is quite the opposite. He has worked hard to assist with Astraea despite a big move, busy personal life, and running his own sims. Though Ari doesn’t always appreciate Liam’s input, I am thankful for Stuart’s. Welcome to Astraea’s December Status Update! And ermergerd it’s December already! Holy cow, the holidays are upon us! Happy Hanukkah to those who celebrate it! Also, good luck to those who need to venture out into the crazy world that is Holiday Shopping Season. I know I still have a LOT to do to prepare for Christmas. This month saw a new player join us and one leave. M.A., playing Lieutenant Avathaimaru sh'Jinn, joined us as Chief Security/Tactical Officer. And Kim has decided to leave after much discussion. As Kim played our CMO and we need the position filled, I will be playing an EMH in their place until we have a new CMO. I have awarded the previous PoTM awards to those who have earned them. Please remember to check out the awards and nominate your fellow players for an award! November was a slow month for us with only 4 posts going out. We have been diligently working on our two big JPs, but I want to stress how important it is for players to do solo posts or jps with each other. I haven’t seen very much interaction between players and I would love to see more! Come up with things that your characters can interact over! Even if it’s just running into each other in the mess and having a chat over a meal! Interact! Get to know one another! A team is currently assisting the Livermoore and preparing to beam three of their crew over to our sickbay. Also, the final post of this mission has gone out. I will be starting the next mission soon. The player of the month for November is Steve, who plays Lieutenant Ren Kannu and Lieutenant Commander Ras Th’zaanaq. Yes, again. As with last month, Steve continues to step up and help both IC and OOC despite raising two girls, being a loving husband, working, and running his two sims. All characters except our new Chief Sec/Tac are on BFMS (https://www.bravofleet.com/wp-admin/index.php). Thank you to those who have added their characters and M.A. if you could please create your character, it would be greatly appreciated. Ari had attempted to hail the shuttle with no answer, so she switched to attempting to call Faltan Station. It took a few attempts, but before long she was hearing the equally exhausted sounding voice of Commander Prescott of Faltan Station.